Armenia is known for many things. Winning the World Chess Olympiad is one. Being the home to Noah’s Ark (a popular story in the Bible) is another. But there is so much more. Several monasteries and cathedrals are under the protection of UNESCO as World Heritage Sites and are popular destination for almost half a million visitors every year from around the world. Located in the Ararat plain, this area is famous for where Noah’s Ark landed. Mount Ararat is a national symbol of Armenia and if you go there, you must take some pictures of teh mountains in your background. The mountains are visible from most of Armenia, but better picture oppurtunities will be a little outside of the capital Yerevan and closer to the mountains. Located in Yerevan, the nation’s capital, it is where most of the country’s celebrations and festivals are conducted every year. Also located in Yerevan, this park is also home to the military museum and the Mother Armenia statue. Armenia’s famous statue of Sasuntsi Davit (David of Sasun) on horseback is located at the Sasuntsi Davit Metro station on Tigran Mets Street in Yerevan. The Armenian Opera Theatre in Yerevan is home to many a cultural event celebrated in the form of opera and ballet. A memorial dedicated to the victims of the Armenian Genocide; it is located on a hill overlooking Yerevan, Armenia. Every year on April 24, hundreds of thousands of Armenians gather here to remember the victims of the 1915 Armenian Genocide that took place in the Ottoman Empire carried out by the Turkish government. Lake Sevan (Armenian: Sevana lich ) is the largest lake in Armenia and the Caucasus region. It is one of the largest high-altitude lakes in the world. It has many beautiful beaches and points of interest. The most famous cultural monument is the Sevanavank monastery near the town of Sevan at the northwestern shore. Another monastery at the western shore is Hayravank Monastery, and further south, in the village of Noraduz, there is a field of khachkars, a cemetery with approximately 900 khachkars of different styles. Additional khachkars are found at Nerk’in Getashen on the south coast. When the water level fell, many archaeological artifacts were found, 2000 years of age and older (some as old as the early Bronze Age). Most of them are now displayed in Yerevan. Known as the “Fortress in the Clouds”, it is located in Ashtarak & Byurakan, and is known to date back as far as the 7th century. With a beautiful bell tower and rose gardens, this cathedral is considered to be the central church of Armenian Christians and is located in the Armavir Province. Located in Kotayk Marz, this 4th century monastery is now a UNESCO World Heritage Site for its splendid architecture. An excellent way to entertain your family, this zoo is home to almost 200 animal species, and is located in Yerevan. Located in the Aragatsotn Province, this mountain is considered to be the highest point in Armenia and definitely worth visiting. The Khor Virap Monastery is a 17th century Church located close to Mt. Ararat. It provides a spectacular and majestic view of Mount Ararat. It is also one of the most visited church and tourist spots of Armenia. Located in Yerevan too, this is one of the oldest religious buildings in Armenia, and is a must-see for every tourist. The Armenian Genocide of 1915 refers to systematic massacre of around 1.5 million Armenians just after World War I in 1915, which was carried out by Turkish Government (Ottoman Empire). The conflict between Armenians and Turks goes back years. Armenia became under Ottoman rule during the 15th and 16th centuries. The Armenians being Christians were treated very badly and as second class citizen by the Turks who were Muslims. They were overtaxed, subjected to brigandage, kidnapping and forced to convert to Islam. Christians in Ottoman were not treated as equals to Muslims, this included other ethnicities like Greeks. Christian religious practices could be punished by law. The genocide was organized by army officers’ movement known as The Young Turks, which was assembled around 1908. Unlike Hitler or Stalin’s ideological reasons for doing so, the Young Turks were different. They had political reasons for their mass murder. Propaganda at that time accused the Armenian people of being saboteurs and a pro-Russian “fifth column” because of they were on Germany’s side and losing in World War I. Not only were Armenians who were in the Ottoman Army killed and their property confiscated, 300 leading Armenian officials and community leaders were arrested on April 24, 1915 to be executed later. This is why Armenians commemorate this great tragedy on April 24th every year. This day is generally known to be the start of the Armenian Genocide and what followed in the coming months and year was the systematic massacre of up to 1.5 million Armenians. The goal of the Ottoman Empire was to eliminate all Armenians. Initially many Armenian men were requested to join the Army, but the plan was to kill the able men first. Without any regard for gender or age, Armenians were rounded up in the region of Anatolia and deported to the Syrian Desert or neighboring areas, where most of them died of starvation or disease. Similar deportations were done all over. Many Armenian women were rapped by Ottoman soldiers and left for death. Populations of villagers were taken and burned at once. Many women and children were placed on boats and then thrown over board in the Black Sea. Morphine overdoes was used to kill children. Toxic gas was used to kill students in 2 schools. Many were gathered in camps and left for death by starvation and disease. 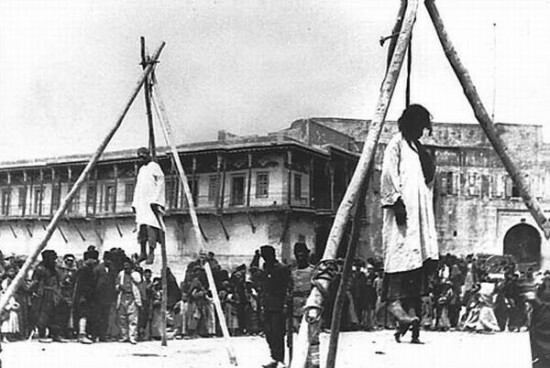 Much like the Jews, the Armenians will never forget this atrocity committed with malicious intent to systematically destroy every Armenian. While Turkey until this day and age attributes that figure to about 300,000 people, scholars think otherwise. Turkey denies that a genocide ever happened and claims they lost just as many people on their side.There have been numerous attempts to pass a resolution in the US to officially recognize the genocide, however due to the US ties with Turkey, the congress has never approved such a bill. Passing such a bill would mean loosing of a good ally in the region. US has military bases in Turkey. There are 21 countries that have officially recognized the Armenian Genocide, including France, Argentina and Sweden. 43 US states have also recognized the genocide.